I liked Ron a lot, I paid attention to him. I thought he was a major part of the trio and did a lot to help them. He was also and anchor for Harry as a friend and visa versa throughout the series and I loved their friendship - I thought it was one of the highlights of the series. Edit: sorry, I also forgot to mention how much I loved the fact that Ron's importance to the trio was shown in DH. I think a lot of people tended to underestimate Ron because he didn't have the intelligence of Hermione, and he wasn't "the chosen one." But he was the glue that held them together, and I think without Ron it would have taken Harry and Hermione a longer time to destroy the Horcruxes. Yeah, it really wasn't the story of Harry Potter was it, it was about the three of them! 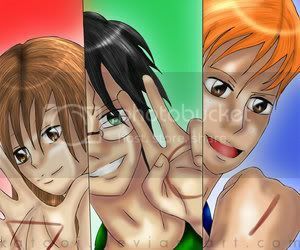 Their adventures throughout the 7 books. Harry couldn't do it alone, you need your friends. That's also how I have always felt about the books, ever since I started reading them. The story has always been about the three of them, and I was very annoyed by the OotP film where there was this totally absurd theme of Harry feeling like the lonely hero who wants to let go of his sidekicks because love makes him him weak blah blah blah. That annoyed me to no end, because it's a total contrary of the books' idea of friendship, represented by the Trio. All three of them are the main characters, as far as I'm concerned. As for Ron, what can one say. I think Jo said it very well - it's his good heart that really matters. But beyond that, he was developed as a very wholesome, believable and greatly enjoyable character in my opinion, especially in GoF, HBP and DH. 1. Ron is the sixth of the Weasley children. He has endured the hand me downs of his brothers most of his life (and has not always been pleased about doing so! ), has been mercilessly picked on by his brothers Fred and George, and constantly complains about his family's finances; in fact his deepest desire in book one was to emerge from the shadow of his family. What influence have these factors had on the development of Ron? In what ways would Ron be different if his family had been different? If they weren't "blood traitors"? If Ron were once again faced with the Mirror of Erised, would he see the same thing he saw as a first year, or has he grown to accept his family more? Ron's exceptional older brothers make him want to stand out and be recognized for something other than being "just another Weasley". That he is overshadowed by the achievements of his older siblings is the cause of Ron's insecurities, and perhaps it might have been a factor in his befriending of Harry in the very beginning, since being famous Harry Potter's best friend was likely to get him some notoriety. Ron might have been a little more sure of himself if he hadn't had so many accomplished siblings, and I think he might not have cared so much about getting recognition for his own outstanding deeds. But I believe that Ron might not see today what he saw in the Mirror of Erised in PS/SS - I believe he successfully overcame his insecurities by the end of DH and beyond. 2. How has the loyalty Ron has shown to his friends and family progressed through out the books? When faced with conflicting loyalties (the choice between Percy and Harry in OotP), what factors influence how he chooses his loyalties? Why do you think he left Harry and Hermione in DH? Why do you think he came back? Ron's loyalty sometimes falters during trying situations or times when he himself feels betrayed, as in GoF and DH. But in the end, he always returns to his friends and family. In DH, I think he left Harry and Hermione due to a number of factors, the first being the influence of the horcrux locket. Just like the One Ring in LotR, the locket serves to sew evil among the trio, causing Ron to harbor evil feelings toward them. But in the end, he came back to his friends because that is truly where his loyalties lay. Without the influence of the locket, he was able to think clearly and realize he definitely shouldn't have left. 3. Ron's strategic mind, which we are first introduced to via his dominance in Wizard Chess, has been displayed in many different manners. How has his ability to think strategically helped Harry throughout the series? Aside from winning the chess game in PS/SS, I think Ron's stragetic mind helped the trio in DH in planning how they were going to get into the Ministry of Magic to steal the locket. 4. What did you think of Ron's confrontation with his worst fears when he destroyed the locket horcrux? Do you think this helped him move past them? Yes, I believe Ron's facing his worst fears through the locket horcrux helped him a great deal. These were things that Ron needed to overcome, and being able to physically destroy his worst fears was very helpful in letting him move past them. 5. What do you think Ron's life was like post DH? What careers might he have chosen? Ron probably settled down with Hermione to raise their family. He would have had to deal with the loss of Fred and other loved ones, but the birth of his children would have been a definite highlight. As to his careers, per Rowling, Ron works in the joke shop with George and later works in the Auror Department with Harry. What did you think of Ron's confrontation with his worst fears when he destroyed the locket horcrux? Do you think this helped him move past them? I do think that confronting his worst fears helped him move on. He was worrying about Hermione's possible feelings for Harry, and I think that Harry's words made Ron realize that Harry only sees Hermione as a sister. Hearing the horcrux say Ron's worst fears aloud was, in my opinion, a way for Ron to finally acknowledge them. He doesn't voice any of those in the series. Actually, one of the only fears heard of is his fear of spiders! Hearing the locket helped Ron overcome those fears, I think. The story has always been about the three of them, and I was very annoyed by the OotP film where there was this totally absurd theme of Harry feeling like the lonely hero who wants to let go of his sidekicks because love makes him him weak blah blah blah. That annoyed me to no end, because it's a total contrary of the books' idea of friendship, represented by the Trio. All three of them are the main characters, as far as I'm concerned. In OotP (book), Harry was always angry with Ron and Hermione, specially because of the bickering. He felt like they weren't a trio anymore and couldn't spend more than five minutes without getting angry with each other. In fact, in OotP (film), Harry feels like nobody else could feel like him, he is alone during five minutes, and he returns to the Great Hall to be with his friends because he need to be with them (thanks to Luna). What OotP try to explain is that while Harry feels that is dangerous for his friends, they want to be him, because they love him the way he is. At the end, he knows perfectly that love makes him stronger, and stronger, and this is really the reason for possesion scene. IMO, Harry doesn't want to let go of his sidekicks, is just he didn't want to put them in danger. That's why he didn't want to be with Ginny during the war, it's the same, in differents situations. With the past of the years, I have been falling in love with Ron. At the start, he was the best friend of Harry, but with GoF, OotP and HBP, I completely fell in love with him. Sometimes, he is a jerk. He is. Sometimes, he is a git. He is. But during that times, he is so adorable that you understand that he is the way he is because of love and his heart. When in DH, he left and leave Harry and Hermione alone, I had to stop reading. I couldn't believe that he wasn't there. The sentence "I get it. You choose him" broke my heart to pieces, and I couldn't read without him, was like I was reading but my heart wasn't beating. I can only say that The Silver Doe is PERFECT. It's a fact that Ron is the character that has more insecurities, and the locket affects him in a torturing way that is difficult to explain. He admitted that he already thought the things the locket told him, but this is the dark side of his heart (a dark side that everyone has). He loved Hermione so much that he couldn't believe that that feeling was reciprocal. Harry has always been his best friend, and his worst fear, the thing that would kill him of pain, was the idea that the love of his life and best friend, and his best friend, leave him behind because they fell in love. That was his worst fear and is such a terrible fear that the locket use it to controle him, the way The Diary use Ginny's feelings for Harry to controle him (without the possession). But He is a really good person, and I can't imagine how he was when he was away. Actually, in the film he says, "The more you care, the more you have to lose." Which is the type of Hollywood action-drama film idea that is totally and blissfully missing from any aspect of the Harry Potter series. The fact that Harry says it doesn't mean that he is going to take it into practice. He would never do it, whaterver happens. He is able to love in a way that lot of people that have lost somebody would like, and OotP is an example of love, a love for his best friends. He is only saying that to them because if there is something worst than lost someone, is see the ones you love suffer. What I've always like most about Ron was that he was this normal, well-grounded wizard kid. He had some insecurities, but having five older brothers had a lot to do with that. Hermione was the uptight overachiever, and Harry was the hero, whether he asked for that role or not. Ron gave us the best view into what the wizarding world was like for families and kids, even though his family was so large. He was the "official" sidekick, but he was a decent kid and a loyal friend. And he didn't view Harry as the "famous Harry Potter." Harry was just his buddy, but not because Harry was famous. Harry needed that. He needed to be accepted for himself and hollow fame, and Ron gave him that. 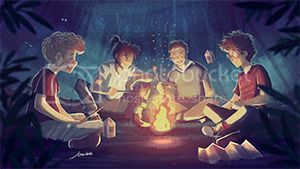 They did get involved in whatever mystery was in each book, but they also hung out together and acted like boys do when they're away at school...well at least like magical boys acted. That was my point. That it was totally out of character, but made it into the film anyway. JKR, NYC-from TLC How different would the last two books be if Arthur had been killed in the middle of book five? I think they would have been very different and it's part of the reason why I chose my mind. ... By turning Ron into half of Harry, in other words by turning Ron into someone who had suffered the loss of a parent, I was going to remove the Weasleys as a refuge for Harry and I was going to necessarily remove a lot of Ron's humor. That's part of the reason why I didn't kill Arthur. I wanted to keep Ron in tact ... a lot of Ron's humor comes from his insensitivity and his immaturity, to be honest about Ron. And Ron finally, I think, you see, grows up in this book. He's the last of the three to reach what I consider adulthood, and he does it then [ when he destroys the horcrux] and faces those things. So that's part of the reason. I am just so glad she added this snippet about Ron growing up after she had gone on about how Ron is so insenstivie and so bad to date. Anyway, I think it is clear to see that Ron grew up. Yes he was the last of the three to mature, but he did. I think it began in HBP after the poisoning. Such a close call from death would have led him to reconsider his priorities. He had, at least it seemed that way, overcome his Quidditch insecurities. I think HBP helped him to become assured in his abilities. But what still needed to be sorted out in DH, the most important issue of all, was his insecurity about his worth and his place in his family and in the trio and of course his significance for Hermione. The locket brought the insecurities and fears he always had pushed into the back of his mind into the forefront. Thus forcing him to deal with them, even if it was very painful not only for him but also for Harry and Hermione. I agree, and yet, Ron seemed still young at heart in the epilogue. I think that he was probably the least mature of the trio (and Ginny) as an adult. But I think that is a very good thing. I would hate to imagine Ron turning into a stuffy old man. He seemed as if he would be a fun-loving and great dad to have around. In comparison, Harry seemed a bit stuffy imo (not that he didn't make a great dad too, I am sure he did). It wasn't that out of character, it was a book too early. In the end of HBP, Harry breaks up with Ginny and tries to get Ron and Hermione to stay behind because he feels like he needs to go on alone. They tell that they aren't staying behind and Hary relents, but the fact is, Harry did feel like he shouldn't drag them along. He did want to go off on his own. And he did it a lot in OotP as well, he didn't want to bring everyone to the DoM. And Harry had to stop himself from saying "Big Deal" about his ability to love in HBP. Harry did feel like it was a weakness, and that he had to stop being close to people so that LV couldn't hurt them. I like the line in the film when Hermione said, "You don't have to do it alone Harry." I felt that was spot on and I was vigourously nodding throughout the whole film although, like I said, I felt it was a film too early. I agree. Ron would've been an awesome dad. He didn't have to be as mature as the others, but obviously he was still responsible enough to be an auror. There's nothing wrong with being a kid at heart, and I imagine being back on platform 9 3/4 played a part of that. A lot of adults act less mature when surrounded by places of their youth. And after reading that quote, I'm glad she didn't kill Arthur. Well, I already was, but now even more so. Ron is my favorite character and a Ron without humor is a fish without water. It would have made the books very boring. Now, I want to answer the questions on this thread, since I haven't done that yet. Sorry, I'm making this post longer. These factors are key to Ron's character. He feels overshadowed by 5 older brothers, and he has a younger sister who is the only girl. He would feel like he has nothing special about him. Everything he owns is "rubbish" and it would create most of his insecurities, such as feeling unworthy of Hermione's love. So obviously, having a different family would've affected Ron. He may've had less humor, he may've had less insecurities, it's hard to say. Ron is who he is largely because of his family. Now, if Ron were faced with the Mirror of Erised again, I'm not sure what he would see. Obviously he wouldn't see himself as overshadowing his brothers, I think he defeated that insecurity, and he definitley has come to accept the fact that is his family. My first reaction would be something similar to Hermione's, but he's got her now. My guess would be that he would see himself surrounded by his and Hermione's children, and all their many cousins at Christmas time. But then, who knows? Ron has always been loyal to Harry and Hermione. We see moments when he surrenders to insecurities, but he never stops being loyal to them. With the Percy/Harry conflict, Percy had disowned Ron and the rest of his family, and Ron saw Harry has more of a brother then Percy had ever been. That choice probably wasn't even difficult, the pain was in the fact that Percy would even ask. AS for DH, I think he left because of the locket's influence. As he said, he was already thinking all those things, but he had some control over them, rational thought told him Harry loved Ginny and that he wouldn't go for Hermione. But the locket seized these insecurities and helped them grow until Ron lost rational thought. He became lost under his own burdens. However, the minute he was out of the locket's range, Ron knew he had to go back. I think this shows that his loyalty never left and that, with rational thought, he knew he had to be with Harry to help him out. He knew where his loyalties had to lie, even if he was wrong. He came back because he knew he had to be there, and I think it also shows bravery that he came back. He didn't know if Harry and Hermione would accept him after what he did, but he tried. And more power to him! That was the most awesome scene in the book for me. It was very emotional, dramatic, and full of symbolism. I don't think it helped him move past his fears, he effectively destroyed them. Those fears were gone, and Ron came out a better and more confident person. I was so proud in that scene, I was crying, just knowing that Ron had finally overcome everything. He may have been the last to reach adulthood, but he did it with the most style. Well, according to Jo, he became an auror, helped revolutinize the department (stragetic mind) and helped George in the joke shop. He seems to have been successful, and I liked that he was able to give his daughter brand-new robes in contrast to his hand-me downs (I loved that in the first two movies, Ron's robes were actually faded, that was great). I love to think about his life with Hermione, and Christmas at the Burrow with all the grandkids. He had a great life, and he deserved it. I agree. Some people just are like that. I recall my late grandfather who remained a kid at heart throughout his life. But that did not mean he wasn´t mature and couldn´t act seriously if the situation afforded it. As JKR said, Ron´s humour is essential and that would have helped the trio through some dark times during Voldemort´s reign, but it would also have been helpful in their later life. And since Hermione tends to be the worrywart and very uptight, he would be the necessary balance, especially for their children. I imagine them making formidable partents with lots of love, caring and laughter in the house. Yes, Harry tried to isolate himself throughout OotP, therefore I found the movie representation spot on with regards to that. AS for DH, I think he left because of the locket's influence. As he said, he was already thinking all those things, but he had some control over them, rational thought told him Harry loved Ginny and that he wouldn't go for Hermione. I agree with everything you said, except that I think the main problem here wasn´t so much if Harry would go for Hermione, but rather if Hermione would eventually go for Harry, because, in Ron´s mind at that time, Harry was 'better' than him. Although deep down Ron knew Hermione liked him back, there was this little piece of nagging doubt and the locket played on that. But the locket seized these insecurities and helped them grow until Ron lost rational thought. He became lost under his own burdens. However, the minute he was out of the locket's range, Ron knew he had to go back. I think this shows that his loyalty never left and that, with rational thought, he knew he had to be with Harry to help him out. He knew where his loyalties had to lie, even if he was wrong. He came back because he knew he had to be there, and I think it also shows bravery that he came back. He didn't know if Harry and Hermione would accept him after what he did, but he tried. And more power to him! Absolutely. It was basically more a mistake and an act of stupidity than cowardice or illoyalty that made Ron run off. Had he been illoyal, he could have went back into the safety of Hogwarts and sell out Harry to LV in exchange for his family´s safety. But he would never do something like that. I agree! The Horcrux scene was absolutely amazing. The Horcrux, Hogwarts Battle, and Snape's Tale will probably go down as some of my favorite chapters in the series. I agree. That was what I was thinking, but it was late and it didn't come across well. Sorry. He wasn't worried about Harry, but in locket thought, he worried Hermione would think she had settled and maybe he had a bit of fear of Harry as well, since he was away from Ginny. But rational thought told him at least that Harry wouldn't ever fall for Hermione.